Any time the surviving Beatles reunite on record is a historic occasion. But a new single from Paul McCartney and Ringo Starr packs in even more classic-rock star power.Starr’s new song “We’re on the Road Again” is one of several collaborations with his former bandmate on his new LP, “Give More Love.” The song also has guest appearances from Joe Walsh, Edgar Winter and Steve Lukather. It’s a slightly goofy ode to life on the road, as Starr boasts that, “We play really tight; we play really loud” and cheekily references his own song “Photograph.”The two Beatles last recorded together on Starr’s 2010 album, “Y Not,” and performed McCartney’s “Queenie Eye” at the 2014 Grammys. 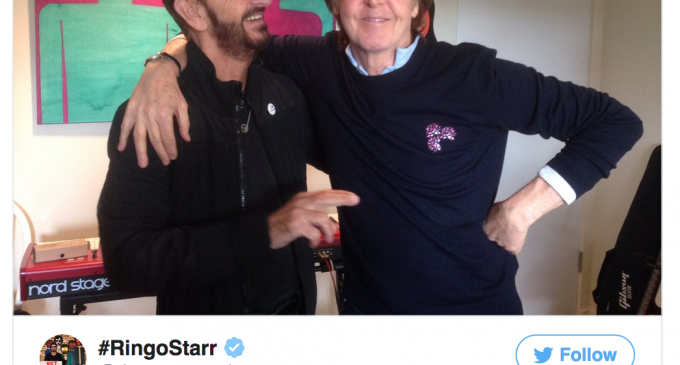 Starr announced the McCartney studio collaboration back in February, thanking the fellow Beatle in a Twitter post. Set for release on Sept. 15, “Give More Love” will also feature cameos from Peter Frampton, Don Was, Richard Marx and Dave Stewart, among others. You can hear Starr’s new track with Paul McCartney via Rolling Stone.